It’s October and you know what that means – the Pumpkin Spice Latte is back! But, for those of you feeling a little less basic than that, I’m bringing you a delicious autumnal soup. 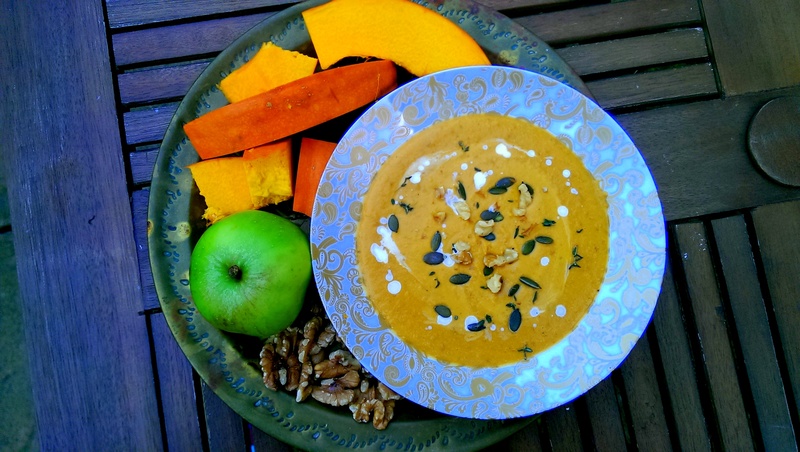 This is a fairly sweet soup – the pumpkin provides body, a subtle sweetness and that gorgeous colour, with the apple bringing in a slightly sharper, more tart sweetness. By blending the walnut into the soup you add even more depth of flavour, while including small amounts of walnut chunks keeps the texture of the soup more interesting. 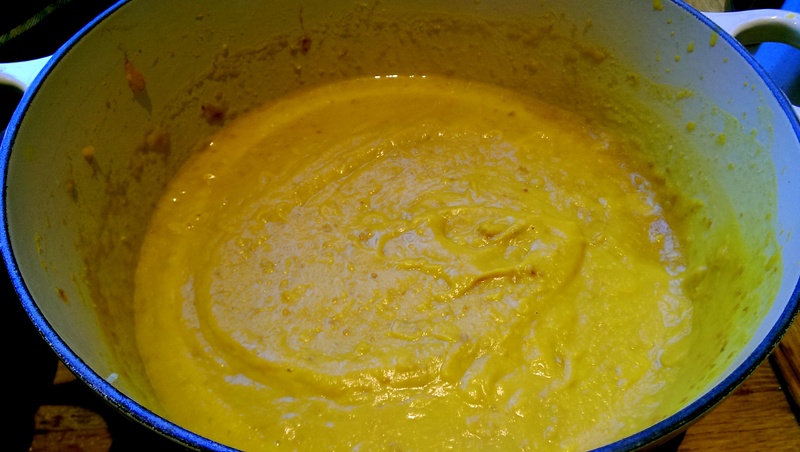 I truly love this soup, it just adds a little more oompf to the classic pumpkin/squash cream soup. You could of course add in a few more veggies – some carrots or onion. Personally I like to avoid too many strong flavours in one soup for fear of over-saturating the flavour profile of the dish. 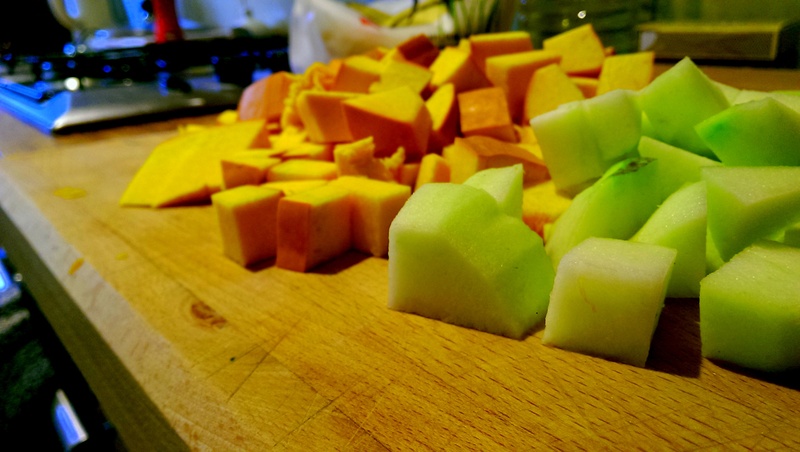 Peel your apple and slice it and the pumpkin into small cubes. 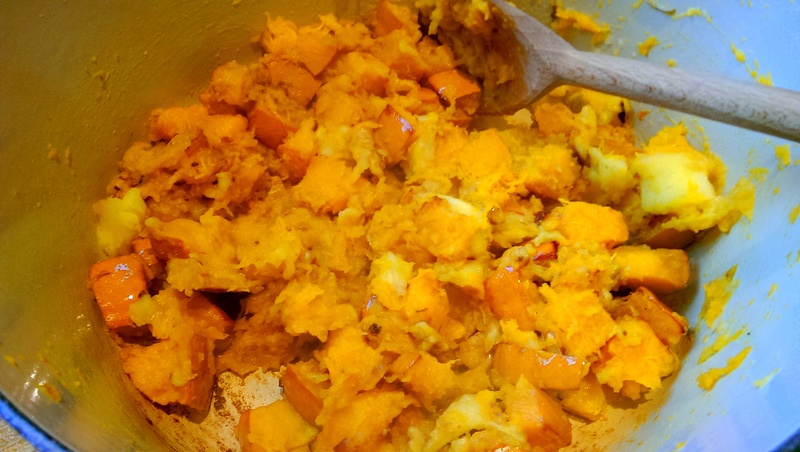 Coat the pumpkin in a little oil and seasoning, then roast until beginning to soften. 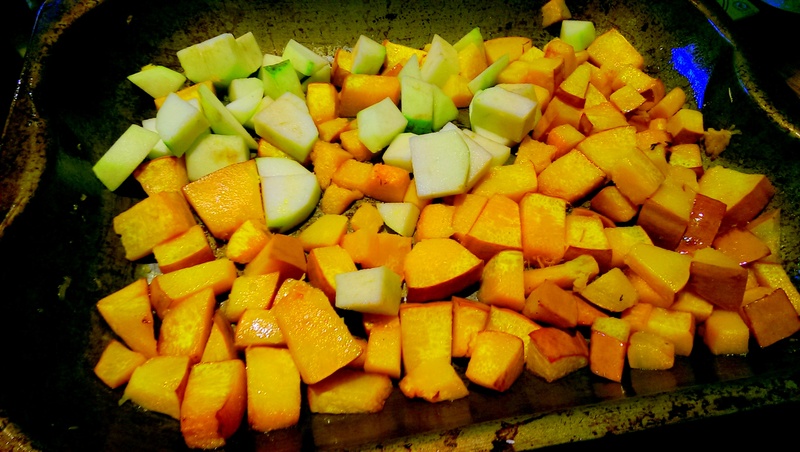 When a knife will go into the pumpkin with only a little resistance add the apple – total cooking time for the pumpkin will be about 35 minutes, with about 10-15 for the apple. 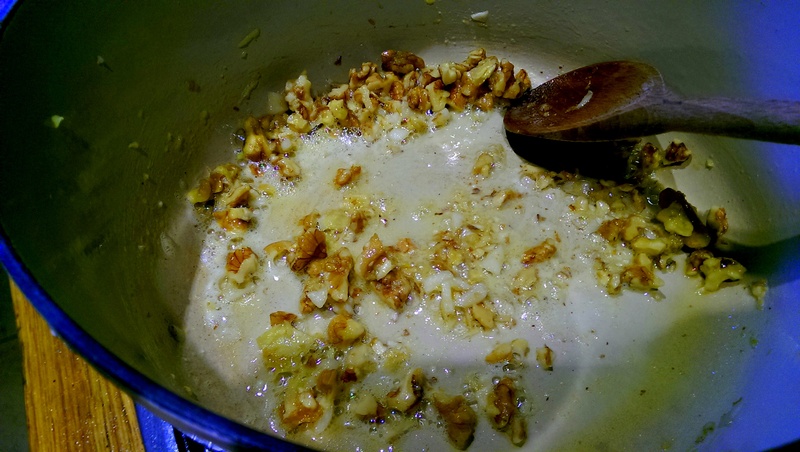 Finely chop your garlic and ginger and crumble a handful of walnuts. 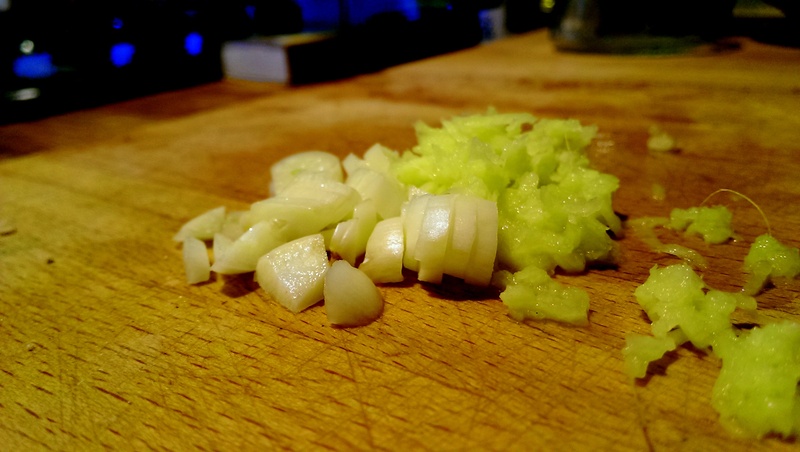 Fry these in a fairly decent sized knob of butter for a few minutes, until the garlic is beginning to brown. Add the pumpkin and apple and mix through. These will be very soft, so will crush to a pureé fairly quickly. Pour in enough vegetable stock to cover the mixture. 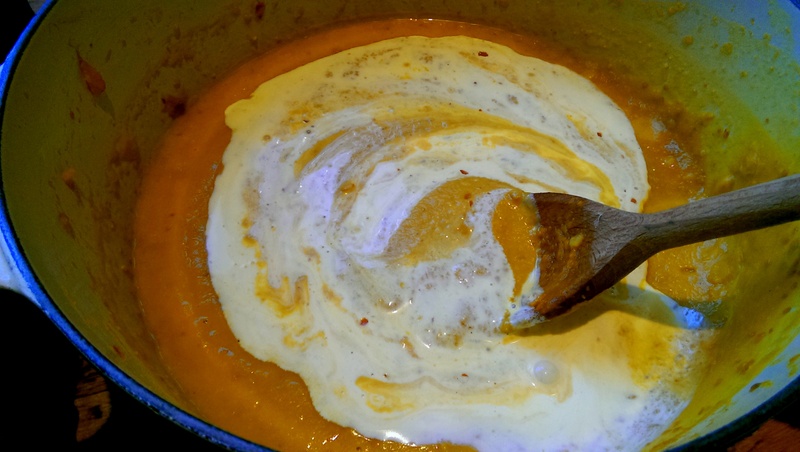 Blend thoroughly – a stick/immersion blender is always best for soups. If using an upright blender, allow the mixture to cool first and do in small batches. You do not want to damage the blender or have the steam blow your lid off. Stir through some cream and a sprinkling of nutmeg/cinnamon to get that pumpkin spice flavour you crave. Taste and season accordingly. Drizzle over a little cream and a sprinkling of something with a bit of crunch – some more walnuts, some pumpkin seeds, whatever. And a sprig of your favourite herb couldn’t hurt! Posted in Guesscipes, Sides and Snacks, Starters, VegetarianTagged apple, autumn, food, guesscipe, healthy, pumpkin, pumpkin spice, recipe, roast, soup, Vegetarian, walnutBookmark the permalink.